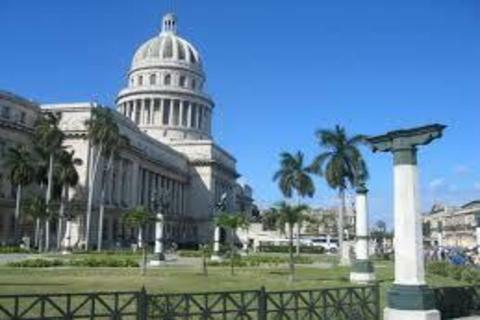 The National Capitol Building (El Capitolio) in Havana was the seat of government of Cuba after the Cuban Revolution in 1959, and is currently the headquarters of the Cuban Academy of Sciences. His design was inspired by the United States Capitol in Washington, DC. Completed in 1929, the building was the tallest building in Havana in the 1950s and also the third largest parliamentary house in the world. The building is similar to the Capitol of Washington, but the architect Eugenio Raynieri was inspired by the dome of the Pantheon of Paris. The dome was built in the United States and is set high above the facade of the building to allow more internal space at the rear of the building. At almost 92 meters high, the dome was the highest point in Havana until the 1950s (this honor now belongs to the José Martí Memorial). The lamps that can be found throughout the building were designed and manufactured especially for the building. In the center of the building two patios provide light and ventilation for the cabinets of the third and fourth floors. There is also a small floor that gives access to the dome.